Let's start with a pro-tip: If you order something on Amazon, and then move houses before it arrives, and it happens that UPS uses USPS to make the final delivery, the chances of your package actually arriving are slim. The best part is when you call UPS, they refer you to Amazon. Who then refers you to USPS, who can only confirm you did indeed update your address because they don't track packages. I guess this is what I get for not being a Prime member and using free shipping. At least Amazon makes it easy to cancel your order (and then buy it at Home Depot). 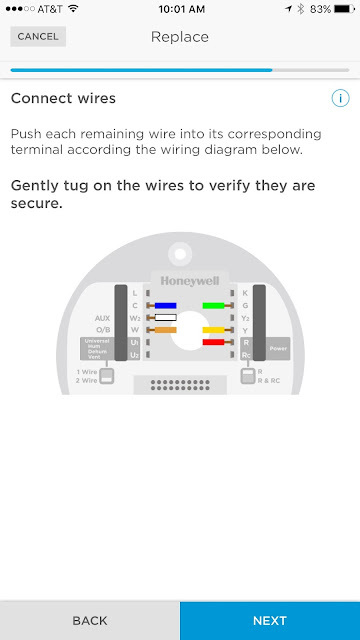 Once I got my hands on Honeywell's Lyric, the installation process began. The first step is to take a picture and write down what colored wires go with each letter. My previous heater only had two wires, so this is a step up in complication. Our system is a heat pump, which also adds a little more complication to the process. The booklet helps you map the wires, but I didn't know about two of the wires. It turns out, the trick is to use Honeywell's app. You add your wires, and then their magic algorithm tells you exactly where to put what. It's actually very cool. It turned out the orange "O" wire needed to be put into "W". Then I ran into a slight cosmetic issue. As you can see in the picture below, the previous thermostat was a big square. The new one is a circle, meaning the corners would stick out and look horrible. Furthermore, the two screws to attach the Lyric are in the middle, right where the gang box is. Thankfully, I had some extra drywall mud and was able to semi-match the existing texture's pattern. I also took a metal cover plate and hammered it flat. It also turned out that the hole for the Lyic isn't in the middle (of course), so I made a new hole slightly higher. Finally, the screws needed to be longer than what the metal cover plate provided, so I took some long screws from a plastic cover plate (that's why the screws are white. Finally, I found some extra paint that matched the wall. That got rid of the ugly corners and gave me a surface to drill the new thermostat into. Here's what it looked like when done. I wanted it to integrate with Apple's HomeKit ("Hey Siri, turn the temperature down 2 degrees"). 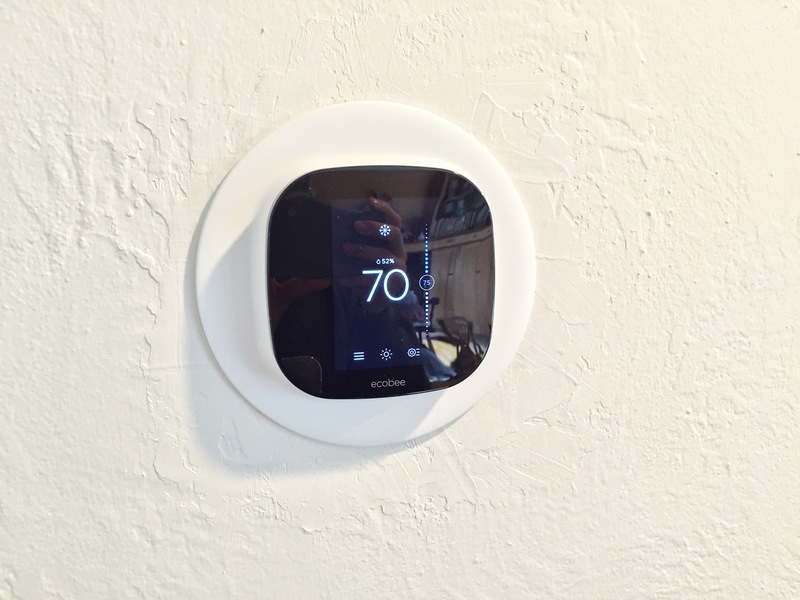 I don't see Nest doing that anytime soon, especially in the mist of their leadership transition. My office isn't in the same room as the thermostat, so Nest would constantly think I'm gone. Lyric uses geofencing with my phone to determine if I'm home or away. This does mean everyone needs a phone, with the app installed, for it to track everyone. Also interesting: it doesn't have the native capability to set a schedule. Instead, you're supposed to use HomeKit's triggers (For example: At 5am set the temperature to X degrees) and the geofencing to set temperatures. I get it, but it's a little weird to not have the native capability that feeds into HomeKit. Remember those two reasons I stated for getting the Lyric? Well guess what, THEY DIDN'T WORK. I was able to connect the Lyric to HomeKit, but none of the other devices were able to detect it. Even Siri never recognized it. 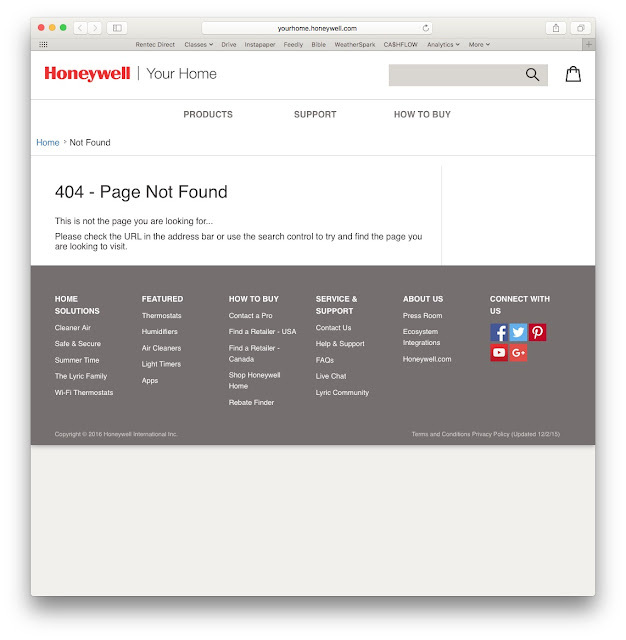 Amazingly, all of their sales pages still work. I was still within the return window, so I decided to stop fighting the Lyric and try something different. I decided to go with the Ecobee3, and it's awesome. Ecobee, based in Toronto Canada, gets that a single sensor in one room doesn't give you the most accurate reading of your home's temperature. So their thermostat comes with one extra sensor, and you can buy more (I bought two more, one for each bedroom and office). 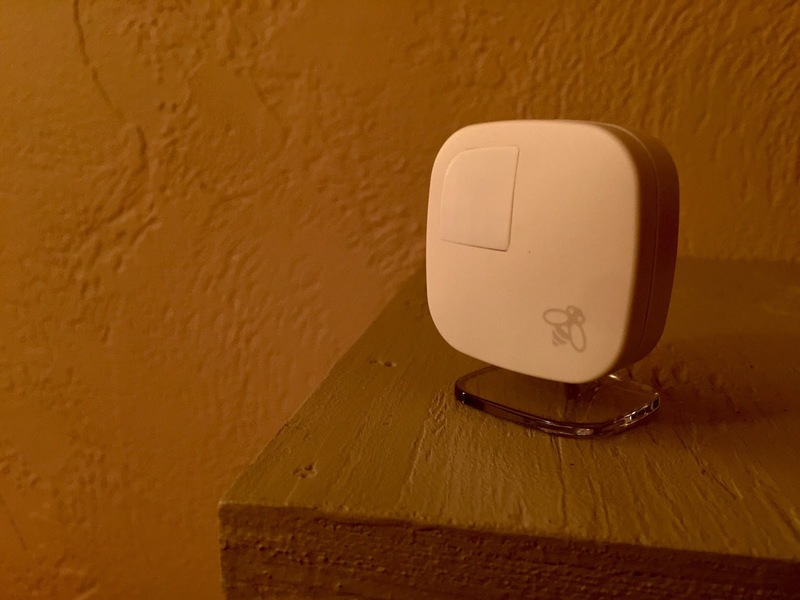 These sensors track the temperature AND your motion. Not only can they tell when you're home, even if you're not in the living room, but they'll optimize the temperature for the room you're actually in. So, at night, I set it to ignore the living room and office, and only take the temperature in the two bedrooms. I forgot to add a reference item. It's only 1.5" wide. The Ecobee supposedly also uses geofencing to track your location (so it can start pre-heating/cooling your home when you come back is my guess). My only complaint, is that it waits way too long to enter away mode. Reading online, it sounds like it waits for 2 hours of no movement before going into away mode. That's way too long. I would like an option to change it to something shorter, like 20 minutes. Thankfully, that's a software update, so it's possible to actually get this. 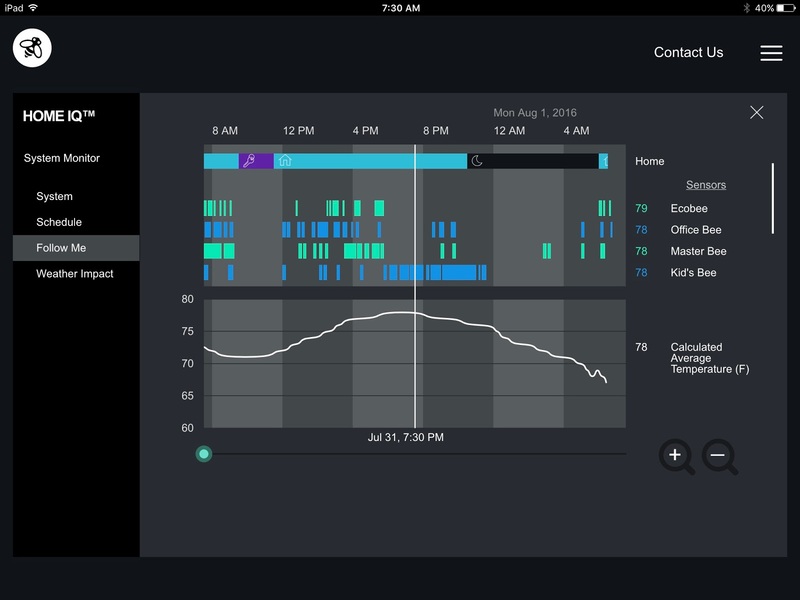 I also LOVE the iPad app and their stats display (called Home IQ). Check this out. The top line shows the "comfort setting". The next four are the sensor's detection of movement. Then it shows the average temperature for each room. We actually turned the thermostat off, which is why you see the temperature going up in the afternoon. 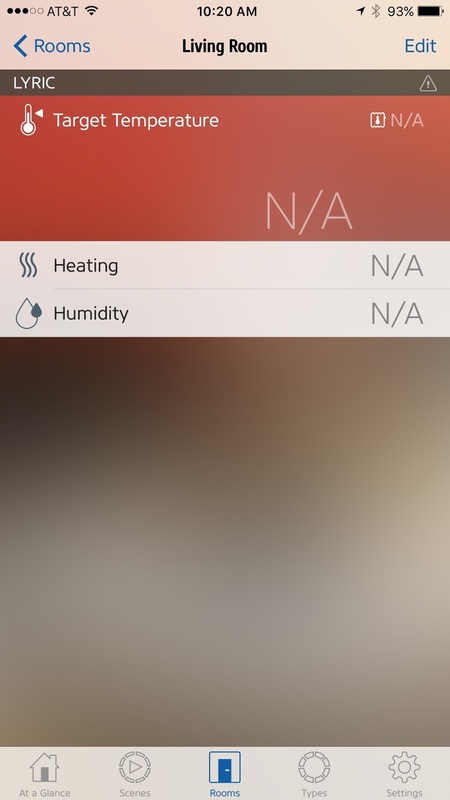 Oh yeah, you can also set a schedule, which the sensors can override if you want (You say you're away, but there's movement, so it switches to the home comfort setting). Plus, it plays nice with HomeKit (and Amazon Eco, Wink, SmartThings, Haiku fans, IFTTT, and more). It does require power, so my old 2-wire system would not have worked. So far each new smart item continues to not be as straight forward as I would like. In this case, it was covering up an old hole (that, and the original thermostat not living up to expectations), but it wasn't too hard to set up. The apps really help a lot to make sure you get the wiring correct. I'm going to hedge and say it's still early, but so far I really like it. The device works well and their apps are polished. I still think the home/away part needs to be improved, but otherwise the experience has been really great. Given this, the integrations with other platforms, and the sensors/geofencing, I think it's better than the Nest. Plus, it looks cool. I also find myself wondering how difficult it would be to set up triggers based on the sensors. Could it turn a light on when I enter the room? How about music following me? When it senses no movement, can it lock my front door? Connecting to IFTTT also seems to open up a world of almost-useful possibilities. It feels strange to like a device more for its possibilities instead of its actual main capability.